As electronic textile practitioners, we are deeply involved in the creation of new technologies. The ideas we have, the things we make, the materials we produce will end up on our bodies, in our lives and our landfills. As careful creatives we are scared by our own creations. Paralysed by the very ideas that excite us. During the eTextile Summercamp 2017 we gathered in an attempt to resolve this inner conflict, and Our Wearable Manifestos were the result. 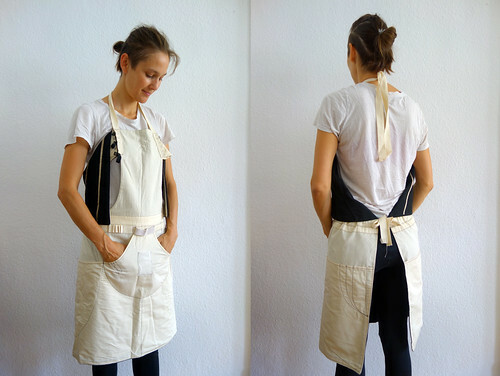 The manifesto is a pattern for a work apron that transforms into a jacket with a capacitive touchpad. 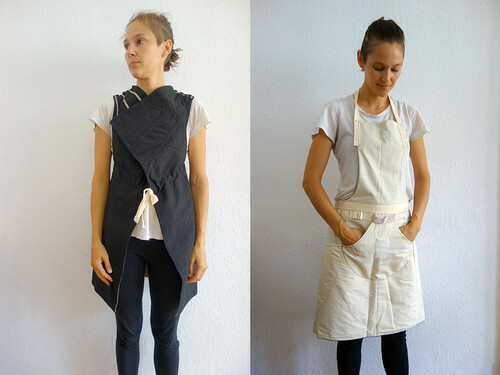 A two-sided garment to illustrate our daily transformation between maker and user. The handmade touchpad as a comment on Google’s closed-source involvement in wearables. Built-in instructions and containing all the tools needed to remake itself, invite you to copy it. In fact, the manifesto must be re-created and customised in order to be fully understood by the person making it. We believe that the only way to fully comprehend technology and it’s implications is to make it yourself. To wear the manifesto is to spread technological curiosity, enthusiasm, scepticism and skill. We are crafters of wearable technologies, engineers of on-body interactions and educators of new minds and bodies. Our practice starts with the basic manipulation of material and ends up in what we will wear. We are bound together by a concern for the future of our skill-set. Our names are: Admar Schoonen, Beam Contre Choc, Celine Marcq, Hannah Perner-Wilson, Lara Grant, Liza Stark, Rachel Freire and Zoe Romano. Every Wearable Manifesto originates from the same “pattern” because we are one COMMUNITY. The pattern is a open (source) design because to SHARE knowledge it to distribute power. There is no exact copy because DIVERSITY is necessary. Your version should produce zero waste, because we CARE what remains. The design evolves every time somebody remakes it because our world is EVER CHANGING. Be aware of ALTERNATIVES, source your materials locally. WICKED PROBLEMS – dealing with complex power structures. Resistance your inner resistance and STAY WEIRED. All the tools needed to produce the Wearable Manifesto should be carried with the manifesto. The wearer is obliged to explain the manifesto. 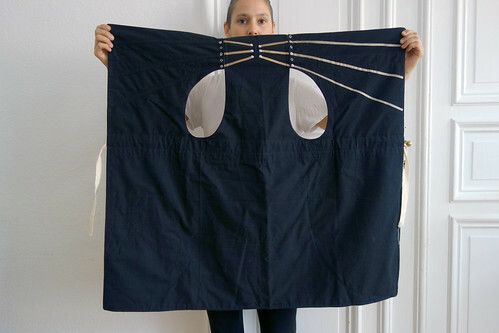 To aide the wearer in explaining, the manifesto is resolved in the design of the garment. The manifesto must be re-created and customised in order to be fully understood by the person making it. We believe that the only way to fully comprehend technology and it’s implications is to make. 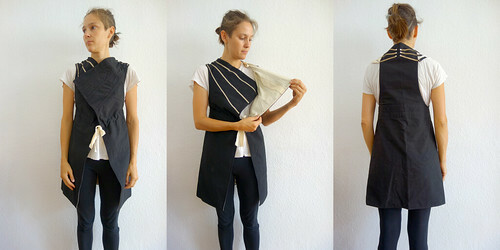 A wearableMANIFESTO is made from a rectangle of fabric. 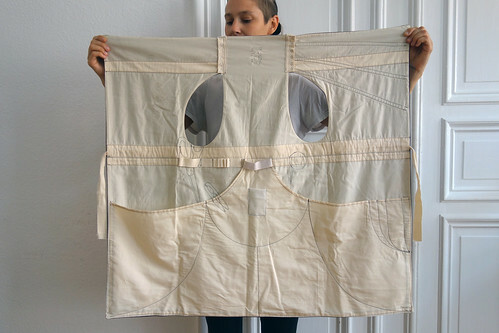 Cut and sewn back together to minimize waste. 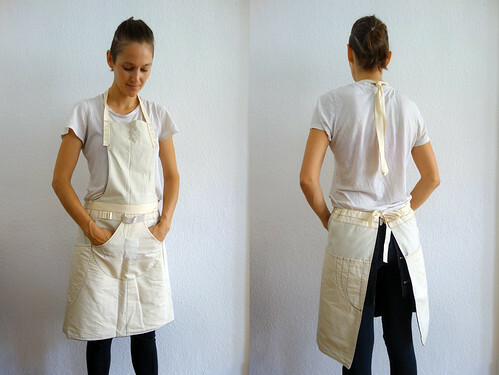 Double sided to transform from a nice jacket into a practical apron. Wearing your tools inside or out. Ready to re-make the manifesto to show other how capacitive sensing works.